Life is a dance of balance, both joyful and chaotic. This Limited Edition by the Giclee method will not be reproduced in any other size. It is one edition only. Jonah and the Whale and a bouillabaisse of denizens of the underwater world. "Fight, Flight or Dance, Blue"
The theme of this piece is transcendence of "survival mode". For living beings faced with threat, it is basic survival strategy that one must either fight or flee (or fly away). Here I offer a third possibility, that of dance as a metaphor for communication, universality and joy. The figures that may be distinguished at a distance in this work are fencers with swords, attacking or defending,, birds, representing flight - or joyful dancers. As one moves in closer and closer, past new creatures that emerge on the way, it gradually becomes clear that identical subcellular components are the fabric from which all are created. The individuation of all the different characters inhabiting this piece is an illusion, a point-of-view imposed by distance. 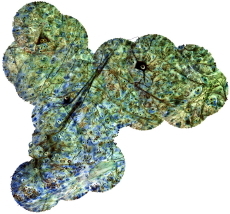 The blue-green colors of this version evoke an under-water environment. "Fight, Flight or Dance, Red"
In this version there are rust and burgundy tones. "En Passage" is based on a transient synapse made "in passing" in a zebra finch brain. I painted entirely in 360 degrees, constantly rotating. It may be hung in any orientation to discover a fresh population of imaginary creatures. Happiness and humor predominate emotionally. Movement is the visual theme, with an elf and a bearded man riding into the scene on the large nerves, and a fan-dancing huntress, a jester and warrior djinni in action. "What the Waters Brought Forth..."
"What the Waters Brought Forth..." teems with life, and as life itself, has both serene and sinister aspects often combined in the same entity. There are fish, birds, clowns, devils, a fetus, a bipedal pregnant creature and her mate, frog kings, bearded magicians, and a shy dancer who becomes an evil phantasm when looked at upside down.